Purinergic P2X receptors are widely expressed in acinar and ductal cells of exocrine glands. Several studies provide evidence for the expression of P2X1, P2X4 and/or P2X7 receptors. 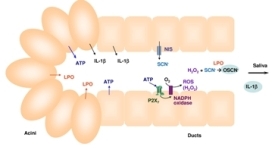 These non-selective cation channels are activated by ATP which can be released by the exocrine glands themselves, following various stimuli like cholinergic stimulation. The P2X7 receptor is unique because of its long intracellular C-terminal domain, allowing the interaction of this receptor with various intracellular proteins. P2X7 receptors are partly localized in lipid rafts. Their activation modulates the activity of enzymes involved in phospholipid signalling and thus the activity of intracellular effectors. Here we give an overview of recent studies which have now confirmed the involvement of exocrine gland P2X7 receptors in various signalling pathways, taking place in host defence and in exocrine secretion.